So yes, why in Southbank now? idk why that came up to mind but I just remembered the last time I was in London and had a super hot coffee in the Starbucks next to the Thames...when for some moments I disconnected from the group conversation and felt hypnotised just by looking at the river and people walking by in front of the Starbucks window.. Boots, long coats, hats, scarves, gloves, coffee on hands..such a lovely scenery for the FW season fashionista lovers. And instead of that I am just on my sport clothes, wet hair, glasses and tea on the side, and London on my mind. If you can't recreate the moment, talk about it. Or in my case, write. And show (I remember taking countless pictures around the city but in this district we were really tired and were just looking for a place to get warm and have a drink). 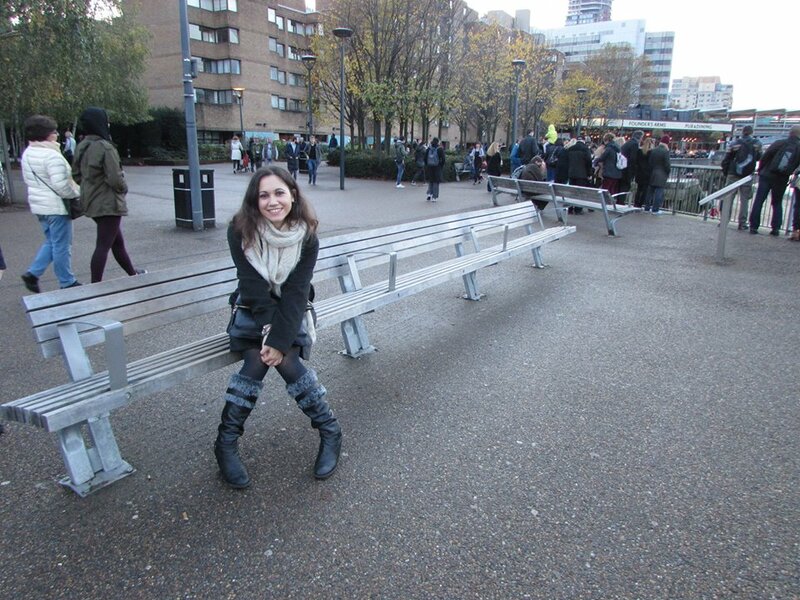 We didn't really go mad on the photo taking at that time of the day but when I saw the benches I remembered a lovely scene from one of my fav films, Love Actually, in which Liam Neeson is with the kid talking about life and relationships... so that was a must picture, even if we weren't on the exact same bench. I have walked what I'm sure every tourist in London has done, the Queen's Walk -which is a promenade between Lambeth Bridge and Tower Bridge. The creation of the pedestrian access along the south bank of the Thames was seen as part of the Jubilee Walkway to mark the Jubilee of Queen Elisabeth II. This is a route for most tourists who walk from London Eye past Tower Bridge and Tower of London. 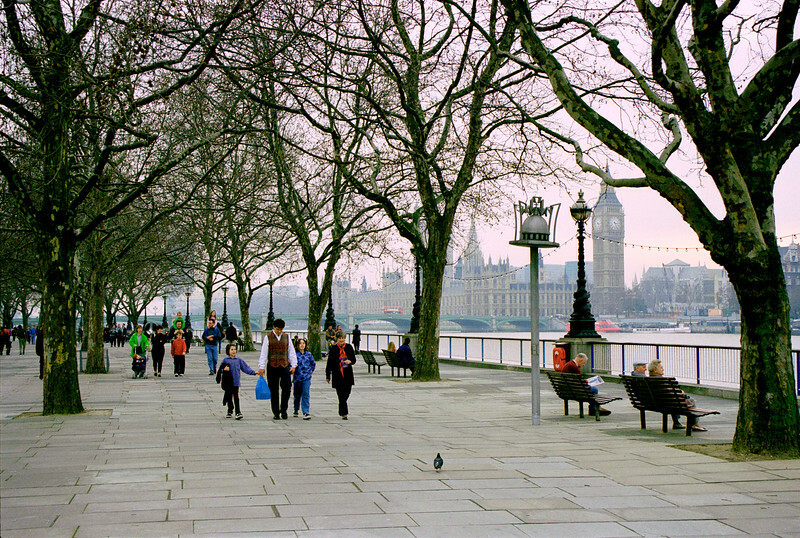 South Bank is a part of London with lots of entertainment and shops. Bounded by Westminster Bridge and Blackfriars Bridge, the name of this district was decided during the Festival of Britain. In this area you can find the County Hall, complex with the Aquarium, the London Dungeon, Jubilee Gardens and the London Eye, Southbank Centre, Royal Festival Hall and National Theatre. During the Middle Ages this place developed as an entertainment area outside the city of London. The London County Council wanted a new County Hall which was built on the south bank in 1917-1922. The building returned the section of the river footage to public use, and this was extended eastwards due the Festival of Britain. This place is a significant arts and entertainment district: it comprises the Royal Festival Hall, the Queen Elisabeth Hall and The Hayward Gallery. The Royal National Theatre, London IMAX cinema and BFI Southbank too. Then there is the London Marriot Hotel County Hall, Sea Life London Aquarium and the London Dungeon, containing the Jubilee Gardens and the London Eye. I have been twice in London and though at first -before going- I wasn't as interested in South bank district as in others- I ended up both times there. And really felt the need to walk aaaall the area next to the river. The scents of food cooked in street stalls, people walking around, seeing the city of London on the other side of the river, and having lots of places to sit for a bit and contemplate everything -it is a must-do whenever you visit the British capital. For those who have been in London, what are your thoughts on this walk?